Happy Thanksgiving! I hope you enjoy a wonderful day with friends and family! And, don’t forget to get everyone out for a walk or other activity before you sit down for the holiday meal. 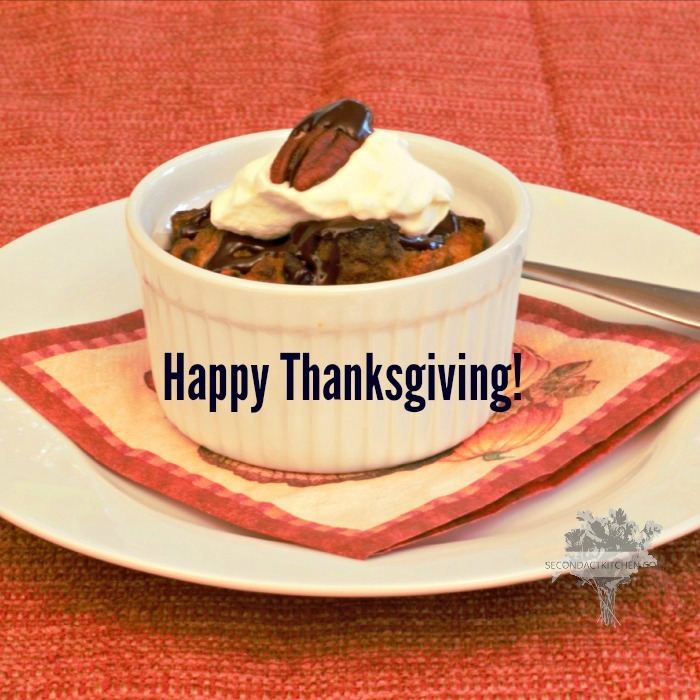 This year, instead of providing a recipe to serve on Thanksgiving Day itself, I decided to offer an alternate dessert you can make for the weekend after the holiday, when you may still have a crowd in town. 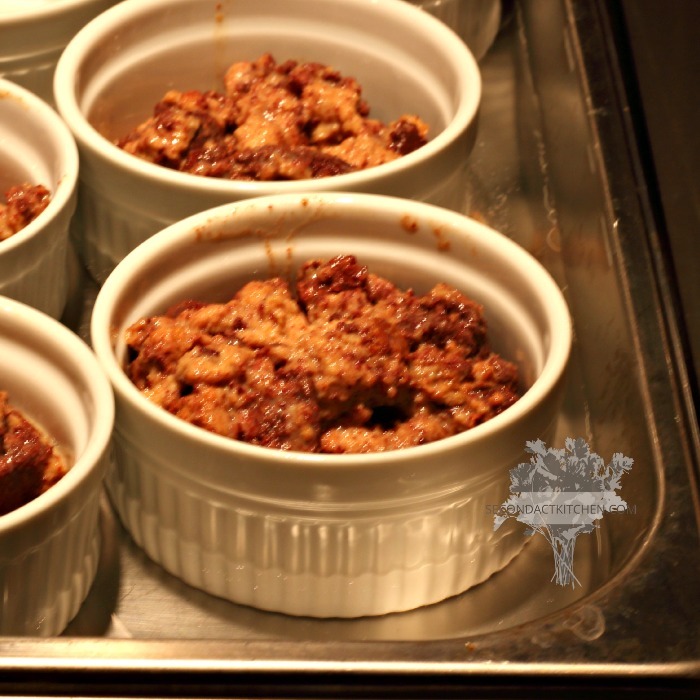 I started making bread puddings a few years ago when I went back to school for culinary training. Bread pudding is an easy dessert to make and chocolate bread pudding has become a family favorite. This recipe is a little different because I have added in pumpkin puree in honor of the holiday. As a result, this dish is a source of both beta-carotene (from the pumpkin) and whole grains (from the whole grain bread). It is easy to make and delicious. Try serving it with a small dollop of fresh whipped cream, or if you want to get fancy, a drizzle of homemade chocolate sauce with whipped cream and perhaps a toasted pecan on top. 1. 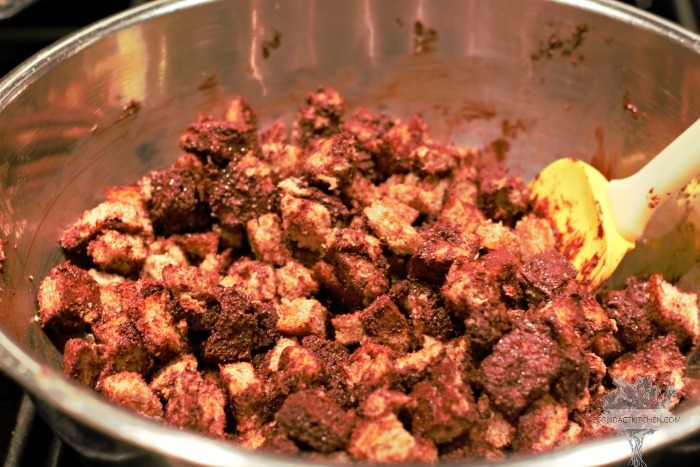 Chop bread into ½” cubes and place in a large bowl. 2. Melt chocolate in a small pan on low heat or use a double boiler. Be careful not to burn the chocolate. 3. Mix chocolate with the bread and stir gently to coat the bread cubes with the melted chocolate. 4. In a separate bowl, mix the rest of the ingredients (eggs, milks, pumpkin, sugar and spices). 5. Add the egg and milk mixture to the large bowl with the chocolate covered bread. Mix gently and allow to sit for 10 minutes. 7. Spray small ramekins with canola oil. Using a ½ cup scoop, place ½ cup of the bread mixture in each dish. 8. Place ramekins in a water bath (approximately ½” deep) in a large baking pan. 9. Bake at 350 degrees F for approximately 1 hour until puffy and brown. 10. Serve with a drizzle of chocolate sauce and a dollop of fresh whipped cream. If desired, top each dessert with a toasted pecan that has been dipped in melted chocolate. Approximate nutrition information per serving: 240 calories; 5 grams fat; 2.5 grams saturated fat; 0 grams transfat; 35 mg cholesterol; 170 mg sodium; 42 grams carbohydrate; 3 grams dietary fiber; 8 grams protein.